Well, apparently I’m feeling called to write an even more personal post…Something that was very relevant to my spiritual life in the last few weeks. I just went to see my spiritual director recently. I don’t always see him for Confession, but I did this time. My penance involved meditation on a very particular passage of scripture. This scripture opens up two very big wounds for me. One has to do with children, the other to do with trust. There are things in my life that I continually strive to suffer well, and there are things in my life I continually try to lift up, work through, and change. One thing I try to suffer well, is having a big hole in my life where my children “should” be, and the another thing I try to lift up, work through, and change, is my issue with trust. Father giving me this scripture passage to meditate upon tore these wounds wide open, to let them weep…now I have to try to give it time, and allow healing and growth to happen in some way. As much as I sometimes want to, I cannot forget the five children I don’t have in my life. Sometimes I really wish the memories of them would just go away. I wish I could go back to a time when I was more naive, when they had not come into existence. A mother really can’t forget. She might be able to be distracted, but completely forget. I’m not sure that can happen. It often sounds cliché, but God does love us more than anyone else ever could. Even one’s own mother. A mother can be distracted from her children. A mother who has experienced the death of a child, however that death may have occurred, may want to forget, and may even forget temporarily. God’s love however is supernatural and goes far beyond the natural love we might feel for a son or daughter, and what a strong love that is! I never take a passage of scripture without exploring the rest of the passage. Put simply, Isaiah is the prophet who prophesied the coming of the Messiah. Chapter 49 of Isaiah speaks of not just of the restoration of Israel, but of the salvation of the world through Israel. The passage goes on, Zion had assumed itself abandoned by God, it further expresses the increase, protection, and blessing of Israel by the Lord. Everyone I think feels alone and abandoned, much of the time. So, why is it so hard to turn to God and to trust? It has to do with love. Trust finds itself in love. 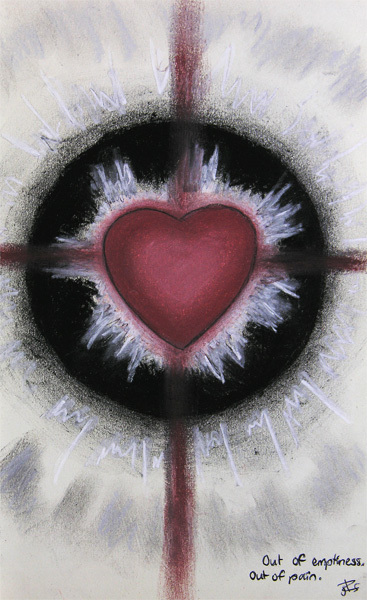 “The heart, when it is hardened, is not free and if it is not free it is because it does not love: that was how the Apostle John’s First Letter concluded. Perfect love chases away fear. In love there is no fear because fear presumes a punishment and he who fears is not perfect in love. He is not free,” the Pope said. “It is only the Holy Spirit that can move your heart to say ‘Father.’” Morning Homily, January 9, 2015. I have had trouble with a hardness of heart since I can remember. A hardened heart cannot love freely and fully because it is fearful. If we rely on our own natural love, we cannot see God the Father for who He is. We cannot understand how He wishes to fully reveal Himself to us in all that we celebrate, and all that we suffer. To really say “Abba” we must ask for supernatural love, given to us as a grace by the Holy Spirit. And so it takes supernatural love to love fully at all—God or neighbor—even our own children. In reality, both of my wounds that I wrote of here—a “lost” motherhood, and trust—both come down to one thing. Love. A love that remembers, and a love that trusts. Come O Holy Spirit, fill the hearts of your faithful and enkindle in them the fire of your love. Send forth your Spirit O Lord, and they shall be created.